My French easel could easily be carried over my shoulder and was always at my side when I encountered an inspiring scene. Those were my first experiences painting with a French easel. After returning home and finishing art school, I began to look for a “real job” that would pay my college bills. Unfortunately, the job I found did not require my painting skills or use of my easel. After taking a job, I got married and began a family. As the years went on, my beloved French easel got shoved farther and farther into the dark corners of our basement until one day a friend spotted it and said how much her father would love to have it. I had switched passions and felt like photography was my new calling in life. It was so much faster to take a meaningful photograph than to paint one! In one fell swoop I gave my easel away. Gone but never forgotten. The years passed, the children grew up and naturally, my daughter enrolled in art school to study painting. I gave her all the art supplies that were still lingering in my studio, but my favored easel was gone. I went online and did some serious research for the best easel I could buy for her. What I settled on was the Jullian French Easel. It is very sturdy yet easy for her to manage and comfortable for her to wear. We live in the hills, so she loves wearing the easel in the backpack that it came with and hiking down into the valley to set up and paint the breathtaking views. Actually, I believe that during high school she could be seen wearing her French easel on her back more often than her school backpack. Not to pass up a wonderful father-daughter opportunity, I set out to buy another easel for myself. I checked the options at different sites selling art supplies and ended up buying a Richeson Deluxe Table Top Easel. It’s freestanding and easy to take anywhere. My daughter and I load up the car with our art supplies and easels and hit the road for the best place to set up our outdoor studio. Once we find a picnic area with a table or two, we both get set up and enjoy a great painting session. I can’t say we’re the best painters in the world, but we have fun trying! Gaila’s story is very heartwarming and fun to read especially the part about painting with her daughter. 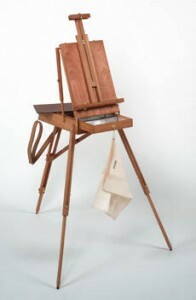 I own and have used various easels over the years including the French easels (full and half box), Sienna Plein Air Pochade Box, and others of my own design. I find them all useful but having an inventive nature (Another career story) I redesign aspects of all my easels. The hardware that holds the panels is always too bulky and conceal too much of the panel. Less is better and exposes all of the painting surface and functions equally as well. I’m constantly thinking of ways also to reduce weight as I get older for ease of transport and I address that as well. Being a long time art tutor and workshop teacher I hear many complaints about flimsy attachment hardware in the French easels and others. I redesign some of it and replace wood screws with like- size machine screws and t-nuts. I’m currently looking into the Soltek easel. But I won’t give up all of my easels. By the way my studio easel is my own design and construction in welded steel on industrial casters with a counter balanced canvas carrier that can be moved up and down with the energy of one finger to get to all parts of a large canvas. It’s, by far, the best studio easel I’ve ever used. I love stories like Gaila’s. Many of my students come back to painting after years of doing other things like raising families.